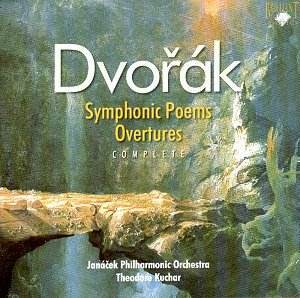 This is a handy box because some of the symphonic poems and overtures are, frankly, works more honoured in the breach than in the hearing. The programmatic ballads are very tricky to programme in concert � too long with a concerto in the first half and unwieldy in the second where one would expect a symphony. Ideally one needs an old Proms concert, maybe even a three-part concert with two intervals where The Golden Spinning Wheel, say, would fit more comfortably. When did you last hear it in concert? On disc it�s a different matter. Kudos then to the Kuchar-Brilliant team, though geographical homework is necessary for this Dutch company; the resident Jan�ček Philharmonic Orchestra will be amazed to find that their hometown, Ostrava, is in Slovenia. Mind you it�s one better than the American company that located Prague in the Balkans. Trivia aside this is a thoroughly engaging and spry set. Kuchar has shown in his Russian repertoire that he is a thoroughly sensitive musician and when he goes further afield (e.g. Roy Harris, on Naxos) the results have been splendid. If his Dvoř�k isn�t quite so special then that�s probably because there are a raft of recordings, present and, particularly, past against which these performances must be measured. Here are a few pointers to Kuchar�s way with this body of work. He tends to be brisk; not businesslike, if that implies superficiality and a lack of warmth and detail, but certainly fast-ish. My Home is despatched in 8.57, which is by no means remorseless but when Kertesz and, especially, Krombholc take that bit longer (the latter 9.40 and he�s only slightly broader than the Hungarian) the result tells in weight and stirring peroration. In truth Kuchar does sound just that bit lightweight alongside the Czech conductor, who scores in gravity and depth. In the same vein the Hussite Overture lacks that vein of sprung rhythm that gives such life to Kertesz�s disc - and the brass drowning the strings doesn�t help much either. In Nature�s Realm is inscribed with real sensitivity and burnishing life by Krombholc and Kuchar�s worthy performance does rather pale. That there are a wide variety of approaches can be shown by the 1948 Talich; the great conductor is considerably slower than almost everyone on record. As indeed he is in Othello � where he takes sixteen and a half minutes to Kuchar�s fourteen � the sagacious Krombholc is somewhere in the middle. Here Kuchar�s linear approach scores in cohesion but somewhat undercooks the drama, the brooding intensity of which Talich elongates to intense effect. It would be rather wearying to delve too deeply into the specificities of these performances but I should add that Carnival is fast, and a tiny bit slick if one compares him with Ančerl. Kuchar�s Water Goblin takes Talich�s spriteliness (in both 1949, where he�s fast and 1954 where�s he slows considerably but is in poorer and live sound). The Noon-Day Witch is perfectly serviceable but listen to Talich or Kertesz and you�ll hear a greater weight of string tone and a caressing intimacy of phrasing and a degree of rhythmic intensity that rather elude Kuchar and his team. Talich shows the way with the Wood Dove, sometimes called Wild Dove [Holoubek] � he�s a shade quicker and more insidious and mocking. The Golden Spinning Wheel has a good sense of rustic drama and the Symphonic Variations is generally well shaped. Those looking for a handy introduction should go to someone I�ve not yet mentioned � Kubelík�s Bavarian recordings re-released on DG Trio - supplemented by the Kertesz Deccas (I�m not always an uncritical admirer of his symphonic cycle but the "fillers" are good) and then the Talich and Ancerl recordings. You�ll find the old Krombholc a bit tricky to track down but you won�t regret the effort.